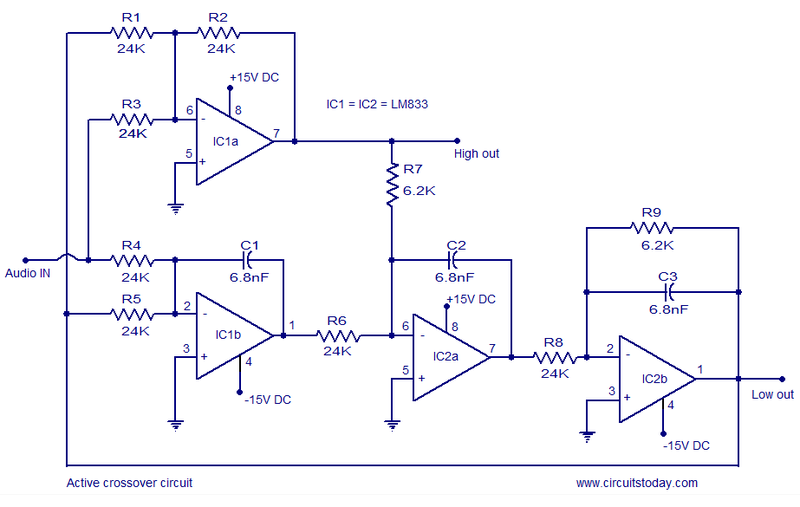 Given below is an Active crossover circuit suitable for HiFi audio systems using LM833, the dual operational amplifier. Crossover circuits are of two types, active and passive. Passive crossover circuit uses passive components only and they are very simple, but they waste a considerable amount of energy and also induce distortion. Active crossovers does not have the above said draw backs and they are a better option for HiFi audio systems. Active crossovers split the incoming complex audio signal into to two bands, a low frequency out and a high frequency out. These two bands a separately amplified by two power amplifier stages, one tuned to the low frequency band and the other tuned to high frequency stage respectively (bi-amping). The cross over circuit given here uses LM833 National Semiconductors. LM833 is a dual operational amplifier especially designed for audio applications. The circuit requires four opamps and so two LM833 ICs are used here. The circuit can be divided into two parts, a high pass filter section and a low pass filter section. IC2b forms a first order Butterworth low pass filter circuitry and the low frequency out is available at its output pin (pin1). The high frequency out is available at pin 7 of IC1a. For the given components crossover frequency is 1KHz and it is according to the equation Fc = 1/(2Ï€RC). The circuit can be powered using a +15/-15 V DC dual supply. LM833s must be mounted on holders. R and C can be changed for getting different crossover frequencies. Is this by design or a mistake, but is there a polarized 6.8 nano Farad capacitor. The symbol used in the schematic above is of a polarized capacitor( + and – ) All the 6.8nF that I come across is non polarized( no polarity). Please advice if I can use non polarized capacitor? IC LM833 is not available. Please help. Where is yhe “Car Subwoofer Filter” circuit? Is this a broken link?